The U.S. Marine Corps (USMC) created the Joint Mission Planning System - Expeditionary (JMPS-E) to facilitate the amphibious assault mission planning process. This software allows real-time collaboration for geographically separated mission planners. While JMPS-E performs well in a wired network environment, it greatly underperforms in a satellite network environment such as that linking USMC ships together. To overcome this problem, USMC must transport mission planner via helicopter to the same large deck ship to plan missions. During the course of a single mission planning process, multiple transports are necessary, resulting in added costs and risks. 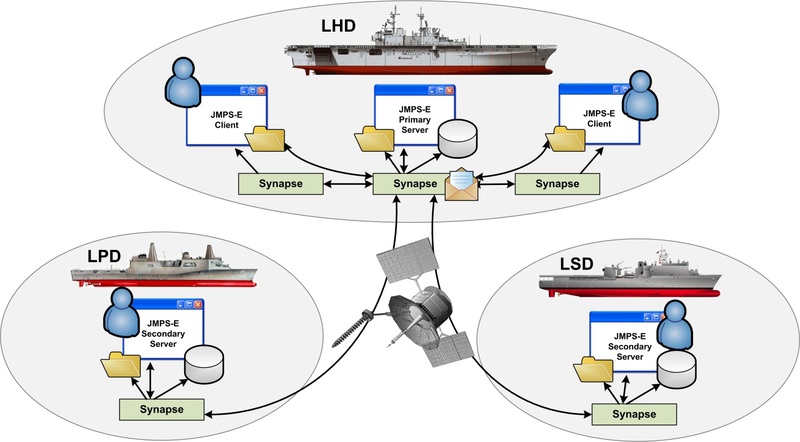 Architecture Technology Corporation designed and built Synapse™, a software product to enable JMPS-E to operate over a satellite network between USMC large deck ships and disadvantaged ships with low and sporadic network bandwidth. Synapse allows for real-time, limited network bandwidth optimized mission planning collaboration between multiple users using JMPS and JMPS-E. Synapse accomplishes this using plug-in software component with innovative compression and caching algorithms in a software plug-in package enabling JMPS-E integration without requiring network modification. With Synapse, USMC mission planners are now able to collaboratively plan missions using JMPS-E.
Synapse operates as a software product running on either a JMPS-E laptop or a standard, off-the-shelf Microsoft Windows-based computer. To ensure affordability, we designed Synapse so only one instance of the software is required per ship. This will support all of the JMPS-E laptops on a ship. Synapse utilizes existing JMPS-E network communication channels; therefore no changes are necessary to the JMPS-E software or the USMC networks. Architecture Technology Corporation has successfully delivered the Synapse software to the U.S. Navy to be installed in amphibious ships supporting the USMC Expeditionary Assault forces. Synapse decreases the Navy’s Amphibious Readiness Battlegroup’s (ARG) time-to-plan with improved accuracy and efficiency, increasing warfighter effectiveness. The quantifiable benefit to the fleet is estimated to exceed $100M.